As a first step we’re going to build a plain old OSGi bundle using Maven archetypes and afterwards we’re going to dig into the possibilities offered by the Blueprint specification. If you’re not familiar with Apache Karaf or you need to install it, please skip to the chapter “Apache Karaf” first! 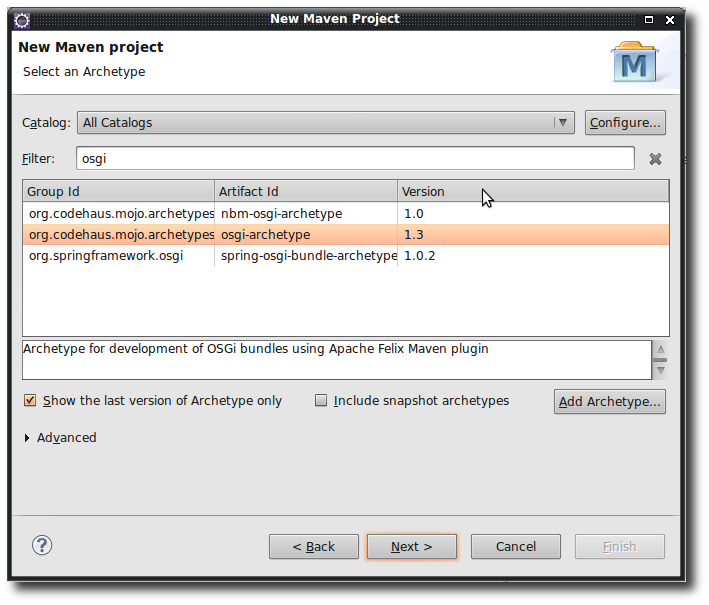 For this purpose we’re creating a new maven project using the archetype org.codehaus.mojo.archetypes:osgi-archetype. *Update* Please use version 1.4 of the archetype. The archetype adds a dependency for the Felix OSGi implementation and the Maven Bundle Plugin that helps to create our bundles. Last but not least we’re adding the OSGi declarations to our pom.xml – the Maven Bundle Plugin creates the META-INF/MANIFEST.MF from this information. Now that we’ve recapitulated the common method to create an OSGi bundle and register services we’re going to build some blueprint-enhanced examples to show the advantages of this specification.. In our first example, we’re reusing the classic bundle that we’ve created in the first step and we’re adding a service listener to our new bundle using Blueprint. What are we doing here? First of all we’re creating a service reference to the SampleService from the first bundle. Second, we’re defining a service listener for that service and because we’re too lazy to create a second class, we’re using our activator again to handle the stuff. In the next example, we’re going to wire some services using blueprint. We’re injecting the SampleService from the first example (regular bundle) and the TimeService from the blueprint service export example into a service in our newly created bundle here. System.out.println("TimeGreetService registered - output: "
I am using version 2.2.6 throughout this tutorial and the installation is quite easy ..
Just download the corresponding version for your operating system of choice from the Karaf website and unzip it somewhere. Now switch to <installation_directory>/bin and run the karaf executable. The shell is quite comfortable – I have listed the most important commands for you here – for a full list just type TAB and ENTER or use the help command. “org.osgi.framework.BundleException: Unresolved constraint in bundle somepackage.somebundle : Unable to resolve 10.0: missing requirement [10.0] osgi.wiring.package; (&(osgi.wiring.package=org.osgi.service.blueprint)(version>=1.0.0)(! (version>=2.0.0)))” – Be sure to use an OSGi container that supports the Blueprint specification .. e.g. Apache Karaf or SpringDM Server. 2016-01-25: Project directory structure description added. This entry was posted on Monday, April 16th, 2012 at 8:17 pm	and is filed under Enterprise, Java. You can follow any responses to this entry through the RSS 2.0 feed. You can skip to the end and leave a response. Pinging is currently not allowed. hence when I deploy both the bundles, only the following message is printed and no greeting is printed. then the greeting message is printed as well. thanks a lot for mentioning! While creating a new Maven project, I don’t get the osgi-archetype (org.codehaus.mojo.archetypes).I get only the pre-installed spring archetype. Can somebody tell me how to install the osgi archetype provided by codehaus? Did any body try last example?? its not work out for me. There is a wiring error while starting the bundle i am getting below error. Really wish you had shown us the folder structure on the side and you did not mention we have to go to each projects pom.xml and add the export statements there for the services to be shown under exports! is there anything missing in the sources linked in the article? Ntl, I’ve updated the article to show the exact project’s directory structure – hope it helps. Hi,In first example.After deploying bundle ,how to display that “Hello”+message.I mean how to call that service method. As the tutorial just demonstrates the wiring with OSGi blueprint, we haven’t added an external service like a rest-service or website.